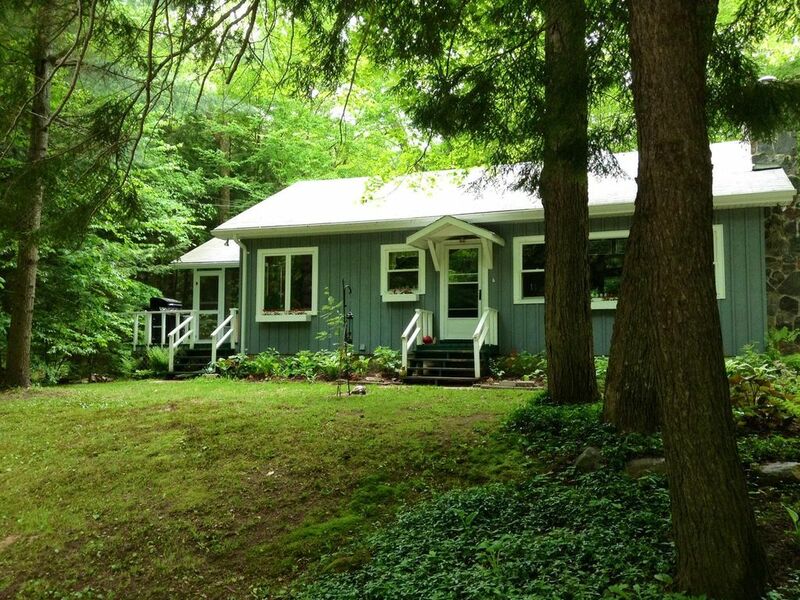 Make this cozy 2 bedroom your home away from home as you visit Muskoka. Located in a peaceful setting on a well treed double lot in the lovely Village of Port Sydney between Huntsville and Bracebridge, 5 minutes from Hwy 11 and approximately 2 1/2 hrs from Toronto. It is within walking distance of a family friendly public beach and a public boat launch. There are 2 bedrooms , one with a double bed and the other has a double bed, a single bed and a crib. Perfect for a couple or a small family. The kitchen is fully equipped. Enjoy meals out in the screened in porch or spend an evening beside the wood burning fireplace. We have cable and wifi. Please note the "average daily rental price" shown and the "instant quote" is in USD. To receive an accurate quote please click on the Rate button and then the CDN button. Warm, inviting and cozy stay! We really appreciated the fully stocked kitchen to make our meals, comfy beds, stunning nature views, and loved how close the cottage is to the beach (10 minutes walking distance), and to Arrowhead provincial park (15 minute drive)! We would definitely stay here again if the opportunity came up! It really is true what all the previous reviewers have said about this little cottage- it feels like a home away from home as soon as you walk in. But it is not just cozy! It has every convenience, even good wifi and an Apple TV for watching Netflix. Best of all for us, the very safe working fireplace gave us our dream scenario of a winter stay. Other pluses- a Muskoka back porch sheilded from the elements with a good bbq; lots of hot water with good pressure; a well-equipped kitchen. It was very quiet and tranquil in the area, and we enjoyed walking to the lake and also skating at Arrowhead Provincial Park, (20 min drive away) which has a trail through the woods. A wonderful winter getaway, and we want to thank Lee-Ann for thinking of everything. We stayed at Lee-Ann's cottage in mid-August with two small children and grandparents. It was clean, comfortable, cozy, warm and inviting. The kids especially loved the toys in the screened in porch, and the short drive down to Pt. Sydney Beach for swimming and jumping off the dock, as well as ice cream at the local general store. It was great to have a home base in Muskoka to rest, relax, sleep, make meals together, as well as explore all that the area has to offer. Having laundry capabilities was also great with two little ones. While staying there we drove an easy 30 minute drive to Gravenhurst for a Muskoka Steamships excursion, to Bracebridge (25 minutes) for Santa's Village, a walk by the falls and shopping, as well as dinner and a trip on the Muskoka Heritage Center steam train in Huntsville, only 17 minutes away. We loved our vacation and highly recommend Lee-Ann's cottage for a restful and relaxing stay! Thanks for all of the at-home amenities, Lee-Ann! Our Family getaway in woods was just perfect. We stayed comfy cozy in your darling cottage! That chaise lounge in the covered porch was my favourite spot! It’s my new “happy place”.